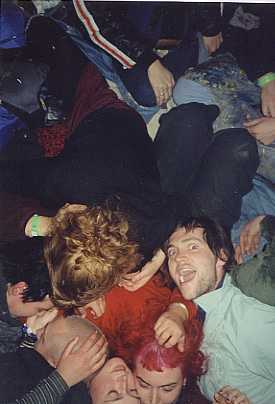 The monkey pile, the communal puddle of good vibes we annually congregate. Brian is the wild one. The Monkey Tribe is a loose affiliation neo-hippy friends I belong to. A family, almost. They're good people, most living somewhere on the West coast. To put it simply, I love my monkeys. To really explain the monkey phenomina, I have to give a little backstory. By the way, this is my personal monkey relationship tail, and isn't meant to represent anyone else's experience. Each monkey finds her/his own way to the tribe. When I left Eugene, Oregon for New York City, I left behind a fairly contiguous social group, unified by the shared rituals of high school parties, graduation, and countless feckless hours of wasted adolescent time. There were of course people who were in and people who were out, various rivalries, and all that stuff, but it was about as happy and harmonious an extended social network as I think anyone develops in an American High School. Over the years following high school, continental drift and college pulled people away from eachother and back again, and the perpetual zeitgeist brought new souls into the mix. Of the people who ended up basing themselves in Eugene, fault lines appeared along the cultural tropes of "punks" and "hippies". But that pat analysis is misleading: the split goes far beyond differences in taste. I don't really understand the basis for most of the devision, other than people just rubbing eachother the wrong way and maybe some old old grudges. I (and mark) still move freely in both circles, but the twain don't mix all that will. Real family and the intentional family mix: the second year around, I invited my sister Brieanna join the monkeys. It's been grand. Flash forward to the summer of 2000. I'm back in Eugene, living and working, making money for school and trying to have a good time. On the one hand you have these hippie people I'm friends with, but the friendship is somewhat uncomfortable and frought with tension, because on the other hand I'm also friends with these punk people. Not the best situation. My best friend Mark is living with a bunch of the hippies, and it's like his and my friends are almost unwelcome in that house. I'm feeling myself pulled apart, thinking I'll have to make a choice: one group of friends or the other. And then there was the Fair. The Oregon Country Fair is this folksy arts and crafts festival in the woods outside of town. Still truckin' since 1969, we are talking about a seriously magical event. Think woodstock (the original), but with whole families in on the show, babies to granparents. It's a real community, hepcat. The intentional kind. The fair (or more accurately my experience of it) warrants its own page, and in time it will get one. For now just head over to www.oregoncountryfair.org if you need more information. Read the message boards for a lot of poignant bits. 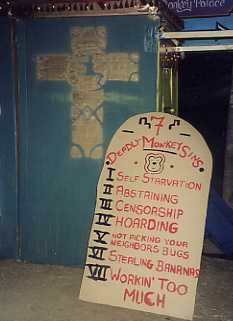 The 7 Deadly Monkey Sins, a prop for the confessional. Anyway, I'd been out there once or twice for the day as a kid (everyone goes at least once), but I'd never "done the fair", meaning I'd never found a job and stayed out there for the whole 96+ hours. My hippie friends and I all camped together for four days and ended up doing some fairly serious bonding. Close friends became closer. New friends became old friends. People I'd known for years suddenly appeared in a new light. All was full of love. It was one of those things that can make you believe in fate, where people come together in an unpredictably powerful and real way. The whole experience was a rebirth for me: to suddenly find myself in a new world (the fair) with it's own customs and rituals and oppotunities and in the midst of a unconditionally loving family (the monkeys). It got me out of having to make a choice between friend-groups, because we all started to understand eachoter so much better, and it made it clear to me what I had to do. I have to figure out how to bring the people together. My monkey mission is to to bring the punks and hippies, the east-coast and the west-coast, the nerds and the cool kids; I want to bring them all together to help eachother and make a stronger alliance for doing Good Things. I think people have a lot more to offer eachother than they often think. I mean, hey, we're all monkeys. 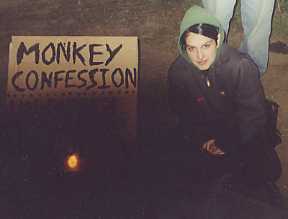 The Kissin' end of the Monkey Confessional. I'm a happy ape. Since the basis of the social unit was cemented at the fair, that remains the logical focus of the Monkey Tribe... for now. In the future, we all plan to put money down on some land and formulate a pirate utopia somewhere on this crowded planet. In the mean time, we keep in touch around the world in the off season via email and phone calls, and I try to gather the family whenever I'm back out west for at least a good meal. These photos, by the way, are from the monkey tribe's sophomore outing (2001). 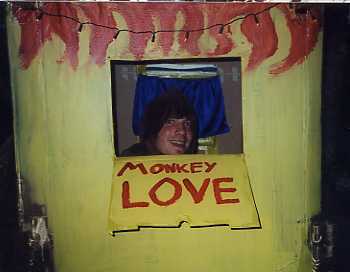 In an effort to give back to the community that helped create us, we built a monkey confessional/kissing booth (you'd be surprised what you can do with a couple refrigerator boxes), feeling that the fair-going public at large could use a little simian liberation, a dash of primal unburdening. I didn't take into account the number of "recovering catholics" we would find, and I think we might have even creeped some people out. But all in all it was a gas and a half. Who knows what the future will bring? I have big plans. The monkey moniker originated, by the way, from our pratice of making simian noises when looking for companions in the darkness, a real necesity at the fair. This past year, we squared off against another tribe (they made a "dic-dic-dic" noise) under the full moon. It was a big braveheart love-in. Monkey Roll Call: Brian, Catheryn, Mark, Shannon, Madeline, Brie, Laurel, Chelsea, Ari, Matt, Jess, Robin, Kim, Amanda, Madeline, Pete, Mary, Amon, Josh. (if I'm forgetting anyone, please let me know).